Simple as it is, as a first timer I had to read the instructions several times to get the flow and the logic. I did feel the lack of a piece of linen for practice since this is the only piece of white linen I've. All learning will have to be done directly on this pattern. Did you notice that the outline is double now? That's one of the preliminaries of Schwalm. 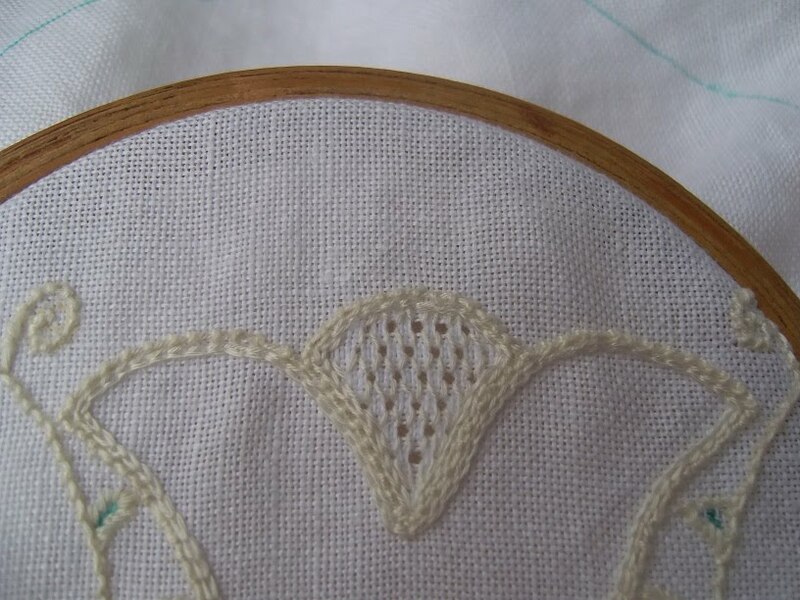 The first outline of coral knot stitches have to be reinforced with a second outline of chain stitch so that when the threads are withdrawn inside the pattern the outer region remains intact.Wait a minute!! Did I say withdrawing?? 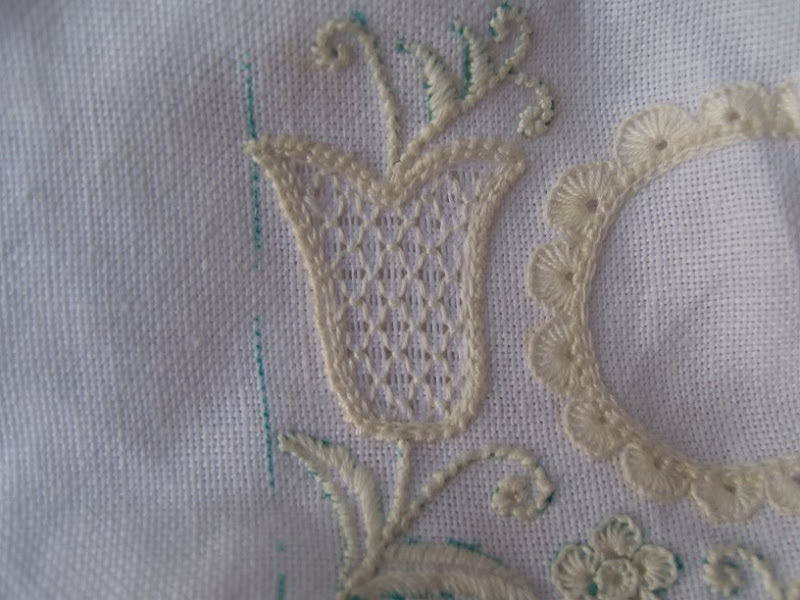 Is pulled thread work and drawn thread work different? Yes they are. 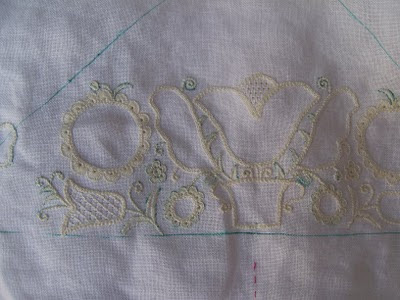 In Pulled thread ,we use the stitches to pull the thread of the fabric tightly to show small gaps. Hence it is also known as Drawn Fabric work. 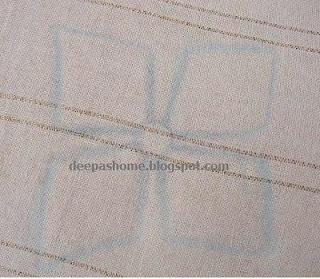 In Drawn thread, threads are cut off or withdrawn and then stitching is done. 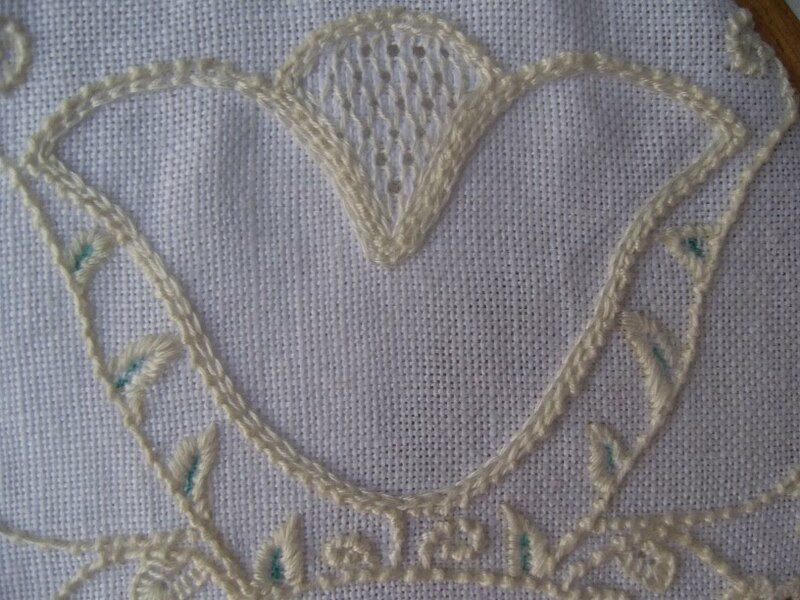 So what is Schwalm embroidery then? I learn the above tidbits while trying to get some more information about wave stitch.All this while I used to think pulled thread and drawn thread are the same. Here's the full view of the pattern. White on white is a little difficult to be seen clearly. So click on the photographs for a better view. Thanks for the get better soon comments and mails. The corners of the nails have dried but the index finger does not like extra pressure at the tip. Otherwise everything else is fine. Deepa! This is coming along beautifully!!! I'm dying to get back to my Schwalm work, but alas, I haven't had time. I've got it on my list for 2011, though! You're doing a great job - it's looking beautiful! Looking good Deepa. Have you worked any double knot stitch yet. That is very good for outlining as well and a strong stitch. Looking good! 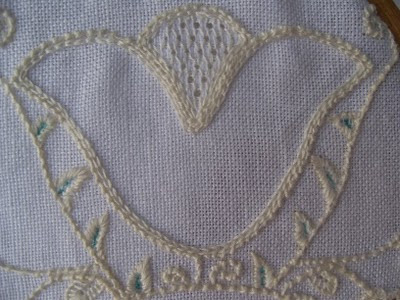 There are so many fascinating filling stitches to learn here! thi is looking good!! appreciate your concentration!! Amazing work, I think that this combination of stitches is beautiful. This is beautiful, I have ordered my book today so am going to have a go after christmas! This is so beautiful Deepa. It is coming out really good.